Turquoise and Rock Crystal necklace. 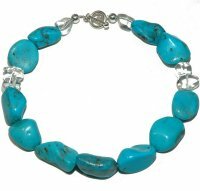 This stylish designer necklace is a single strand of turquoise & clear rock crystal A single row necklace with 11 large Turquoise nuggets (30-35mm) with 6 faceted Rock Crystal (18-20mm) intervals attached to a silver ring and bar clasp. Length 17 inches (43cms).